"There has been no global warming since 1998" - Or has there? You hear this statement a lot in discussions about climate change. It is one of the most oft-repeated arguments against global warming: The average global surface temperature has leveled off. And it's true. Just take a look at this graph, which shows the globally averaged surface temperature rise, from 1997 to 2014, compared to the average temperature in the period 1951-1980. The temperature really hasn't changed that much, if at all. A careless observer would say, that's it: it's settled, there is no global warming, and we can all go home now (in our big fat SUVs, of course). A climate change denier would take this data and crow in comment threads all over the internet (but never in a scientific journal) that 97% of climate scientists are wrong to say that global warming exists, and wrong to say that humans are causing it. But that is taking a myopic view of the world. And it's not very scientific. If you zoomed in on the range 1998-2013, you'd say that the globally averaged surface temperature has been pretty flat, but if you consider the full time range 1970-2013, it becomes clear that the temperature has been rising steadily. But even that is not the whole story. Notice that I've been careful to say "Globally averaged surface temperature". That's because these temperatures came from measurements of the air temperature at the surface, whether of the land or of the oceans. Global heat accumulation data from Nuccitelli et al. (2012). 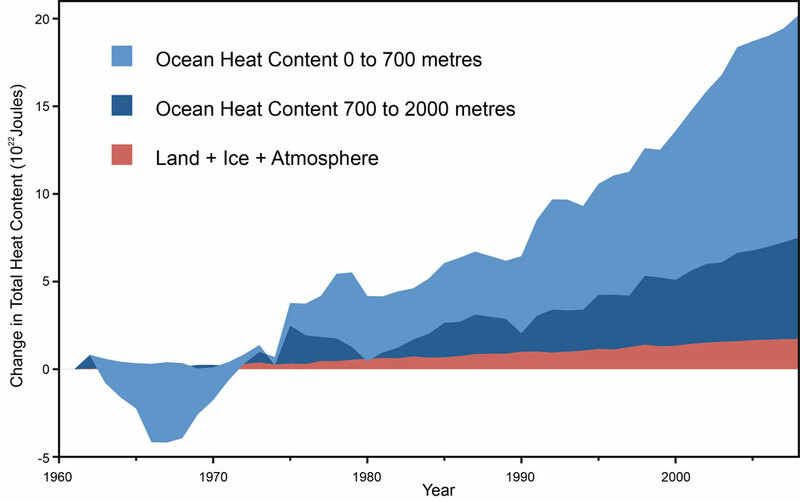 The heat content of the oceans has also been increasing steadily. But while the surface air temperatures have levelled off, the oceans have absorbed heat faster than ever since 1998. 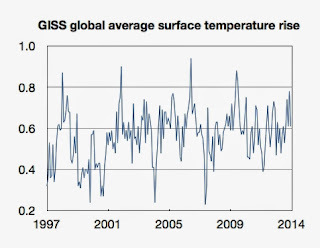 So no: global warming has not stopped or even "paused" since 1998. If anything, it has accelerated. 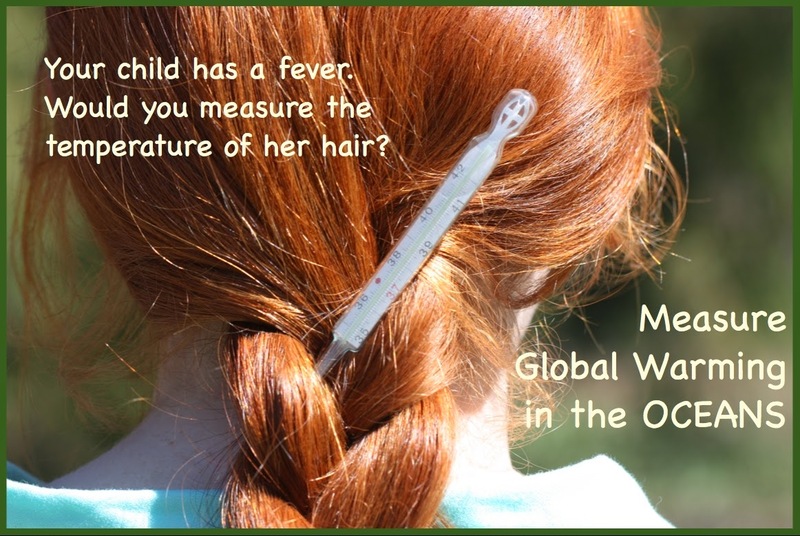 It goes to show that when you're out to measure temperature, you have to think very carefully about where you put your thermometer. After all, if your child has a fever, would you measure her temperature by sticking a thermometer in her hair? Think about it: Even hair close to the scalp is still outside the body proper. If the sun shines on it, hair gets warmer, and dark hair can get positively hot. If the wind blows through it, it will be cooler than the rest of the body. When hair is wet, it cools even faster. It's similar with the atmosphere, of which the thermal properties can change depending on which way the wind blows - quite literally. There are several atmospheric circulations that churn air up to high altitudes, or between the tropics and the polar regions, and that affect the surface temperatures measured close to the ground. El Niño / La Niña variations can raise or lower temperatures in a given year. Volcanic eruptions cause a cooling effect until the ash precipitates out of the atmosphere. In a way, a thermometer put under the tongue is not a very scientific measurement, only a reasonably good estimate of overall body temperature. In contrast, ocean heat measurements are done by an array of devices positioned all over the world, at depths up to 2000m: that's a pretty comprehensive survey, and our most reliable measure of global warming. So yes, global warming is proceeding apace. And yes, humans are responsible for it. *This makes intuitive sense: if you were to magically compress the atmosphere to a liquid with the density of water, its average height would be about 10 metres. In contrast, the oceans have an average depth of 4000 metres. Even though they cover only 75% of the earth's surface, there is just a lot more matter in the oceans than in the atmosphere. Discover the cause of the warming, the end of it, why temperatures are headed down and what to expect. There are only two primary drivers of average global temperature change. They very accurately explain the reported up and down measurements since before 1900 with R2>0.9 (correlation coefficient = 0.95) and provide credible estimates back to the low temperatures of the Little Ice Age (1610). Dan. Come back to me when you have your sunspots paper out in a peer-reviewed journal. Unfortunately, ‘peer review’ of papers on climate science has morphed into an academic club approving each other’s work. My stuff has been ‘peer reviewed’ (affirmatively) by physicists who are not members of the academic club. Expect to hear of it soon. I've been on both sides of peer review and trust the process. Unless you cough up a citation in an accredited journal, you get no credibility. That is your choice, of course. And I share your curiosity . . . about nearly everything.